So far my development and release strategy for the multi driver mode feature was to design, implement and release it in one go. However such multi mode driver design isn’t that trivial. Combine that with my lack of development time for this project and the result was being stuck for a long time. But that is changing now. I am going to release the multi driver mode feature in multiple steps as i progress development. The benefit is that new features are available earlier. On the downside development time may increase, as i need to reimplement and refactor the codebase. Furthermore settings are not guaranteed to be stable among releases. But slow progress is better than no progress at all. This update introduces the Control Center. That is an user mode application, that’ll act as installer and device settings tool. 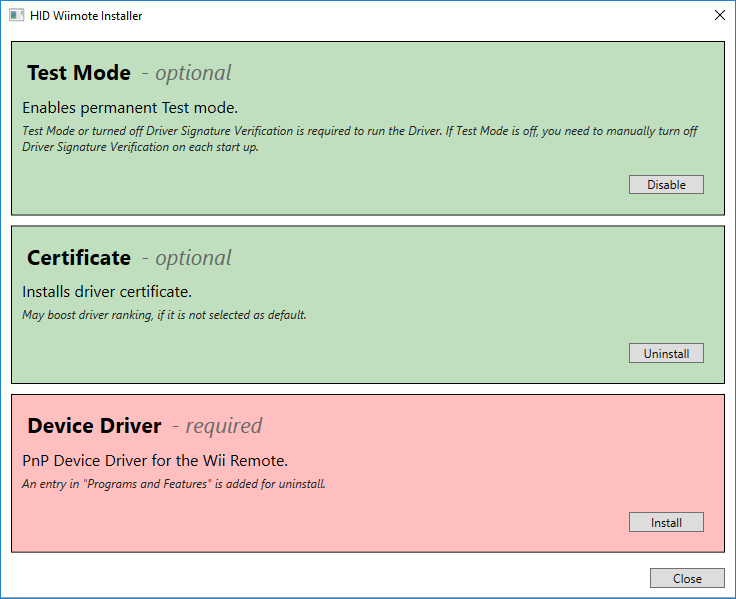 The installer let’s one easily enable and disable Driver Signature Verification (via Test Mode) and install and remove the HID Wiimote device driver. Furthermore for future updates it will automatically detect whether the device driver is installed and replace it (This does not work with pre 0.3.0.0 drivers, so for this update one has to manually remove any previous driver version). The Control Center shows all connected Wiimotes and let’s one apply device specific settings. Those settings include disabling a Wiimote’s accelerometers and some Classic Controller/Wii U Pro Controller mapping variations. The current release only includes the gamepad mode. The following updates are going to resolve around adding further driver modes. The goal is to finally have one driver supporting all kinds of different mode, i.e. IR mouse, DPad mouse, etc. Next up is the raw/passthrough mode. 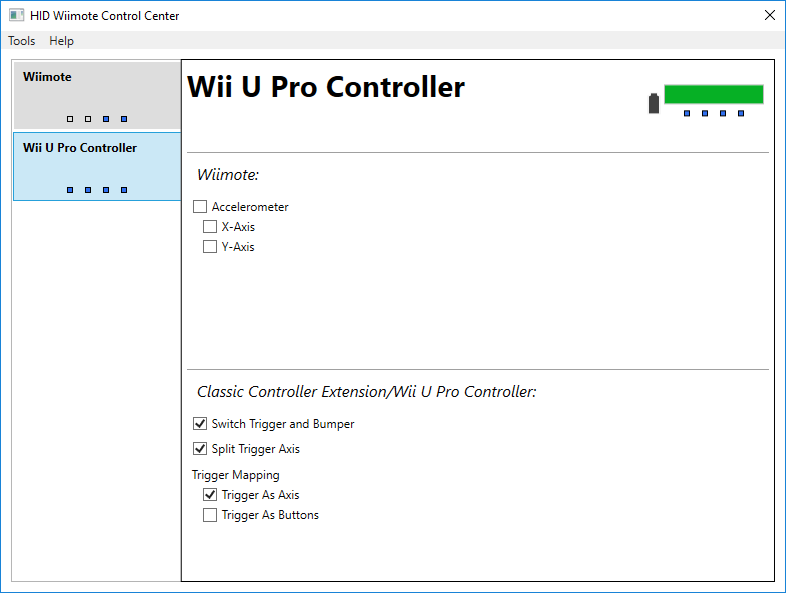 That’ll make HID Wiimote compatible with third party applications, by letting them access the Wii Remote through my driver. So no more annoying driver switching. After that the mouse modes will be added. So long the old mouse version are still available, but won’t get any updates. As said the current release only includes the gamepad mode. So no update for people that use the Wiimote as mouse. Also to simplify the development process a Control Center is only compatible with its accompanied device driver version. Before updating please remove any previous HID Wiimote Version. As always downloads are available on the HID Wiimote page.